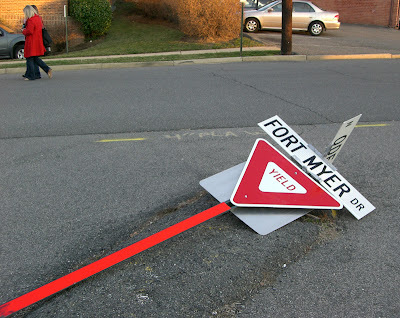 The yield sign at the intersection of Ft. Myer Dr. and N. Ode St. has been knocked down. If you're coming up Ft. Myer Dr. towards the Quarterdeck, be careful about cars coming in from N. Ode St. on the right and not yielding. Update: As of 2/27, the sign is back up.